Board Director and former SASS President Jacob Masina mismanaged last year’s AGM. 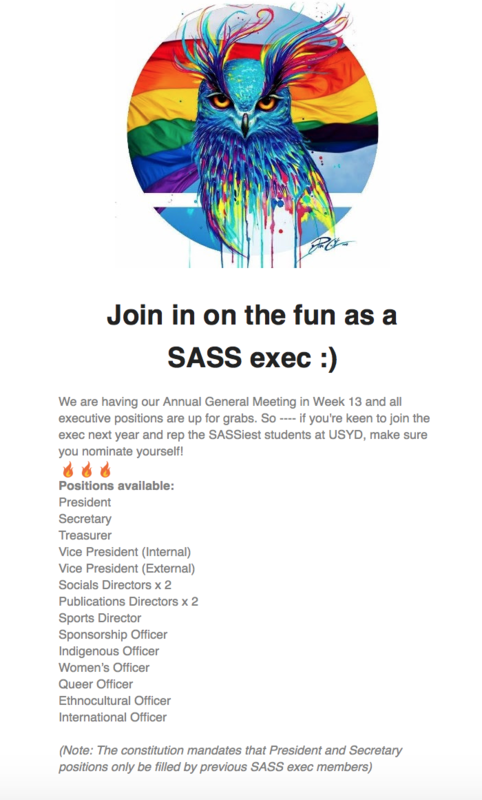 The entire executive of the Sydney Arts Students’ Society (SASS) was invalidly elected, the USU Board has held today, after it emerged SASS’s 2017 AGM took place under prohibited constitutional measures. All executive offices have been vacated and SASS, one of the largest of the USU’s clubs and societies (C&S), must hold a fresh AGM. The prohibited measure is clause 9.a.iii of the SASS constitution, which requires nominees for the role of president and secretary to have previously held positions on the SASS executive. In its July meeting last year, the USU Board vetoed clause 9.a.iii along with several other constitutional amendments. Yet in November, SASS ran its AGM as though the amendments were in place. Senior members of the Moderate Liberals were involved in the failed AGM. Lachlan Finch, a Mod Lib widely tipped to contest May’s USU Board elections, ran for SASS president at last year’s AGM. After no other candidates came forward, Finch was elected unopposed. Along with the rest of the executive, he is now without an official position. Jacob Masina, also a Mod Lib, was 2017 SASS President, and therefore responsible for organising last year’s AGM. During that process, he upheld clause 9.a.iii and other constitutional amendments specifically vetoed by Board. The Board today held this conduct had rendered the AGM void. Masina was himself elected a Board Director in May last year. In that capacity, he attended the July 2017 Board meeting at which the provisions in question were struck down. Masina remains a Board Director and is a strong contender for this year’s Board presidential election, to be held late in Semester 1. In today’s meeting, USU President Courtney Thompson said Masina was “both SASS President and Board Director when this happened and is thus responsible for the error”. “The severity of Jacob’s negligence can’t be understated,” she said, and revealed the Board had at one stage considered censuring him. Under regulation 2.5 of the USU Regulations and Directors’ Duty Statement, a Director may be censured for improperly using their position. If a Board Director is censured, they can be removed from their Board Executive or Committee positions, have any USU remunerations suspended or be forced to apologise. It was a true and honest mistake for which I have sincerely apologised,” he said. Lachlan Finch, who is Masina’s factional ally, told Honi “If there were improper amendments on the books during the AGM it is entirely the fault of the past president.” Finch was 2017 SASS Secretary and so was involved in organising and taking minutes at all society meetings, including the AGM. Clause 9.a.iii is one of several constitutional amendments passed by SASS in 2016. The amendments were designed to prevent ‘AGM-stacking’, which happens when a group, often a stupol faction, floods an AGM with political allies who will outvote rival interests. As the rules stood in 2016, amendments to society constitutions had no effect unless they were approved by the the C&S Committee, subject to Board ratification. But, after protracted discussion, the C&S Committee failed to reach a decision on the 2016 amendments. So in June 2017, the provisions, including clause 9.a.iii, were referred to the full Board. At its July 2017 meeting, 11 Board directors voted to reject clause 9.a.iii along with several other amendments. Masina abstained from the vote due to his conflict of interest as SASS President. Honi understands the Board relayed its decision to the SASS executive in early October. As 2017 SASS Secretary, Finch was qualified under clause 9.a.iii to nominate for president. He was the only candidate to come forward. The SASS constitution, as most recently amended, still contains clause 9.a.iii, as well as the other provisions rejected by the Board. In recent years, SASS has fallen under uninterrupted Liberal control: the last three presidents—Finch, Masina and Edward McCann—have been members of the Moderate Liberal faction. Earlier this year, Honi reported suggestions from SASS members that the Liberals stacked the 2016 AGM. On the other hand, anti-stacking measures have largely been a Liberal initiative, spearheaded by Masina and McCann. Finch defended the measures, including clause 9.a.iii, saying they ensured “experienced team members stayed on to contribute to the society”.